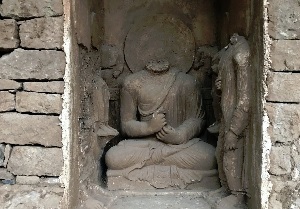 HARIPUR, Pakistan -- Pakistan unveiled the remains of a 1,700-year-old sleeping Buddha image on Wednesday, part of an initiative to encourage tourism and project religious harmony in a region roiled by Islamist militancy. The region was once the centre of Buddhist civilisation that took root under the Mauryan king Ashoka 2,300 years ago. In January, then-Prime Minister Nawaz Sharif inaugurated the restoration of Hindu temples at Katas Raj in Punjab province. Sharif resigned as prime minister in July after the Supreme Court disqualified him for not declaring a source of income and faces trial before an anti-corruption court.